Nicola Marras and Wolfgang Irler are pleased to have had you in the 22th International Meeting of Collectors of Historical Calculating Instruments, which took place September 16th - 18th, 2016 at the MUSE Science Museum in Trento, Italy, where many mathematical devices were displayed for this event. The theme for the meeting takes its inspiration from the comparison of extinct species to the extinct technology of mechanical calculating devices. 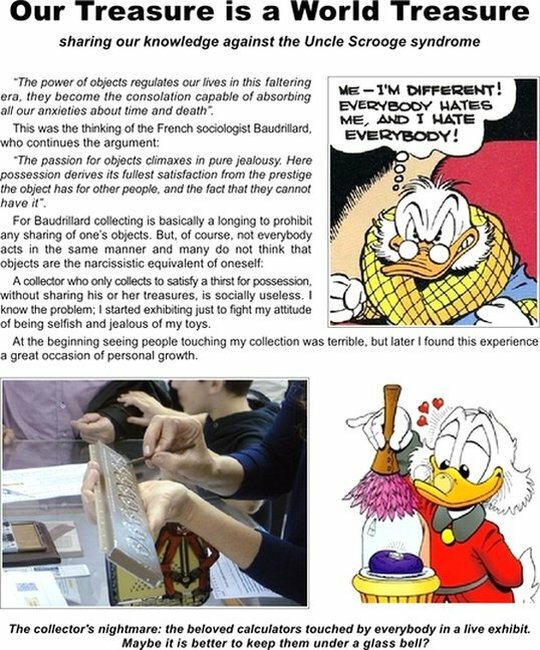 We want reconsidering these historical calculation-related artifacts, putting the main emphasis, not on the achievements of past technology, but on the "material culture", taking into account the historical context that makes these artifacts worthy to be collected, analyzed, and used to explain its evolution. 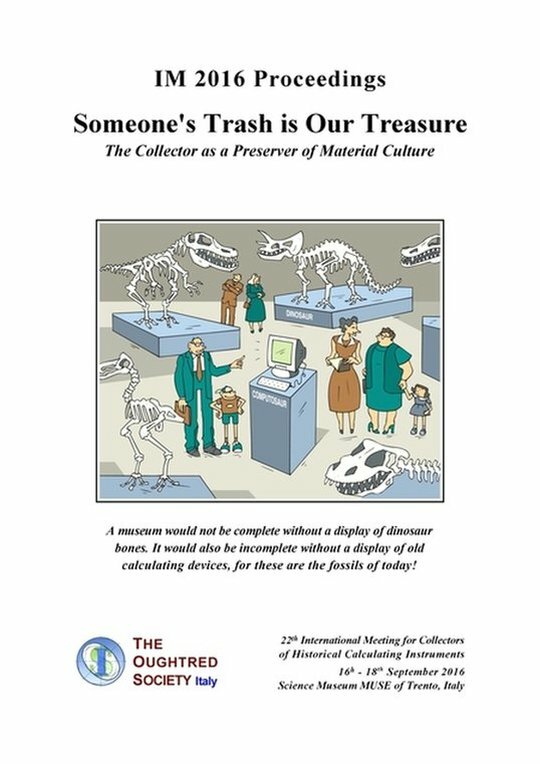 Consequently, the actual collector may be considered as having equal rights to a paleontologist who digs for fossil remains or an archaeologist who searches for human artifacts, rummaging in forgotten cellars and flea-markets. What someone had thrown away became the collector's treasure. In times past, user manuals were the "programs" to be learned ("compiled") by man and "executed" by hand, operating a crank or handle or sliding a wooden rule and then noting the result. In the depths of today's computers, tablets, and smart phones, the underlying algorithms are invisible to the normal user. A mere button press delivers an immediate result. Antique procedures may therefore usefully serve as a didactic methodology to explain the internal functioning of modern devices. Two words about the meeting: was perhaps risky to do it in Italy, here the enthusiasts of old calculators are very few, but we think it was an unusual opportunity to learn about different realities. Indeed, we have been able to visit the important Wolfgang Irler's collection of mechanical calculators and learn about one of the last manufacturers of slide rules. In fact Cesare Baj, with its multiple initiatives, made us think that these instruments still have something to say. His work confirms our motto: "think different think analog", but it is also our job to support his initiatives. Working alone can be frustrating, be supported by a community can give him the energy to continue. A nice surprise was to see young people who grow our hobby. Matteo Munari, with its collection of over 800 slide rules, has allowed us to appreciate many little-known pieces. IM 16 was also a gourmet event with a gala dinner at Villa Madruzzo, one of the best restaurant in town. Download the menu. 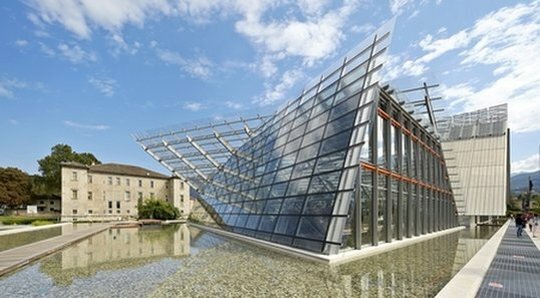 The MUSE: not only a museum, but a center for reflection on the relationship between nature and man. A thank to the editors of the Proceedings. Editing and proofreading a text it is a long process, time-consuming and unpaid. Without the help of David and Donna Sweetman, Jerry McCarthy and Mark McCormick, we would not have published anything! of Computing: the Nathan Zeldes' Personal Look"
On September 16 Dr hab. Zbigniew Fojut presented my history of computing at the Adam Mickiewicz University in Poznan, during the Polish edition of the Science on Stage International festival. Here the presentation in English and here the original Polish.